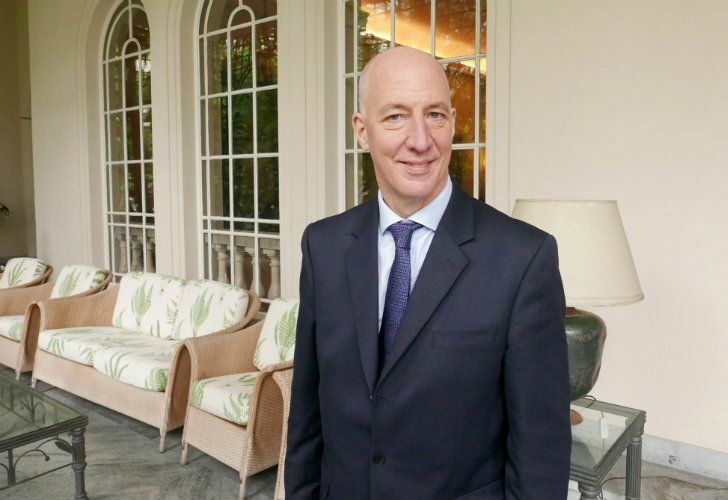 Britain’s Ambassador to Argentina Mark Kent on bilateral relations, additional flights from Argentina to the Malvinas (Falkland) Islands and Theresa May’s scheduled visit to Buenos Aires. In an interview conducted with Perfil this week, Britain’s Ambassador to Argentina Mark Kent discusses bilateral relations with his host nation, Prime Minister Theresa May’s scheduled visit to Buenos Aires next month and working around the sovereignty dispute over the Malvinas (Falkland) Islands. Is the bilateral meeting between [British Prime Minister] Theresa May and [President] Mauricio Macri confirmed? That’s certainly our plan, and [Foreign Minister] Jorge Faurie has been meeting with his counterpart, Jeremy Hunt, in London, and they discussed preparations for the G20 summit. So we very much hope to be welcoming Prime Minister Theresa May here and for there to be a meeting with President Macri. What will be the agenda for their meeting? Will the Malvinas issue be included? Obviously first of all we have to confirm the meeting. And then we will discuss the agenda. But I think there is a wide range of issues they want to touch on. Certainly the G20 presidency of Argentina, which we think has been very successful up until now, Argentina’s candidacy for the OECD, the bilateral relationship in its totality. The past month we’ve seen an increase in trade and investments, we’ve seen more and more projects, so we can expect to have a wideranging discussion, reflecting the rebuilding of our relations in the past two years. After the 2016 joint communiqué by [then-British Foreign Office minister Sir Alan] Duncan and [ex-deputy foreign minister Carlos] Foradori there was a lot of progress in the work with the Red Cross. But what about fisheries and flights between the Malvinas and Argentina? Should we expect some news in those areas? On both of those issues we have seen progress over the past few months. For example, we had a meeting on fisheries in Buenos Aires in May, and we hope there will be another soon, because this is important work where we need to cooperate to protect stocks of fish, of squids, and both sides see this as a priority. On flights we’ve also seen advances toward agreement of a second flight from the islands to the continent. And I hope that we can see that process come to a conclusion in the next few weeks. Increased contact between the islands and the continent is in everybody’s interests. On the Malvinas, many inhabitants think that a flight with a stopover in continental Argentina is not a good idea. Do you think that this is changing? I think in any society you get a range of views, and that’s normal, equally as you have in Argentina or in the UK. But what was agreed by both in September, 2016 – and again when we launched the process jointly with Argentina – is that there will be a stopover in Argentina and what has to be defined now is the exact details. There is always an aspiration in Argentina, and there is a UN resolution, asking for talks on the sovereignty issue… do you see a possibility of this happening anytime soon? Both UK and Argentina are clear on their respective positions around sovereignty, and we work under a sovereignty umbrella. From our position we see as primordial the right to self-determination of the islanders, so if the islanders want to discuss something, then that’s their right. But we believe in their right to self-determination to determine their own future. And the islanders have no intention of discussing sovereignty, they want to stay closely related to the UK. In the past there has been progress in the relationship, especially in the 1990s, but it changed swiftly in the opposite direction after a few years. What’s different now? I think that our relationship is modernising, I think that we have a whole range of challenges, globally, which are new. And I think this calls for us to, as we have done, re-examine our relationships. Argentina is going through the process of, as President Macri has said, intelligent reinsertion in the world. We, in the UK, are taking forward the process of Brexit, which will mean that we will be looking actively for new partners and markets. And these two agendas coincide. We also have important global challenges, like how to ensure we have an effective system of governance and Argentina’s Presidency of the G20 is really important for that, and they have done a great job. Free trade is another issue, how we keep away from protectionism, how we keep global trade going. All these things are very different from the challenges we may have faced 50, 60 years ago. So we need to re-imagine, not just our relationship with Argentina, but globally, and what we are doing with Argentina is part of this. One of the things we’ve done in the past two years is to put aside traditional positions and think about a more empathetic relationship, which is suitable for the modern era. In any diplomatic contact you have to be aware of the differences, but also explore points of commonality and that’s what we’ve done. Don’t you think that the big elephant in the room will eventually wake up and undo the progress achieved so far? Whether you call it an elephant or a sea lion, I think that the most important thing is to have a clear-sighted view. At no point have we said: “We agree on everything and let’s just forget about the issue of the South Atlantic, the issue of the Falklands.” We recognise it’s there and we look for areas where we can operate for the benefit of all, but we don’t pretend to agree on everything. And I know that can be quite sensitive at times, and I know there are people on all sides that sometimes don’t want to see us get closer in our relationships. But my task is to look for ways forward to bring mutual benefits that don’t prejudice the long-held positions of all sides. It’s quite a pragmatic process and you are right, we need to be aware at times it could be vulnerable, it can be subject to attacks from those who want to use our better relationship for political purposes. A better relationship opens the possibility of a decreased military presence in Malvinas? I think that the military presence in the islands, or elsewhere, always will depend on a technical review of what is necessary. What I would say is that we are seeing a closer relationship on the military side as well, between the two armed forces. We have a team of military doctors who are making a visit from the UK to talk with their Argentine counterparts about post-traumatic stress disorder. The number of people who died from suicide, both in the UK and Argentina, is an important number. We’ve seen also for example collaboration for the search of the ARA San Juan, we are having exchanges in training courses too. So we are gradually seen a greater degree of exchange between the armed forces which in itself will help to create greater mutual confidence. Did the recent economic crisis affect investment or commercial projects with the UK? Not that I am aware of. In general what you see when your are looking in trade and investment is first of all an increase in interest at a macro level. Something is happening in Argentina, reform process, greater possibilities for investment, opening of the economy … we are seeing more British investments here, that’s clear, which is coming through. The current economic turbulence which is being experienced here will obviously have an effect on projects, [but] it depends on which project it is. But I don’t think that the fundamental position has changed at all. But don’t people ask you what’s going on in Argentina? after reading all the negative economic news? Yes, of course. People want to know and part of my job is to tell them what’s going on in Argentina ... the fact remains that the international community remains very supportive of Argentina, and its reform efforts and they think this is the right way to go. So there will be difficulties but in the long term this is the way to go. Do you think that the current economic and political improvements in the bilateral relationship will continue with a different government? Yes. What investors look for is a favourable investment climate, where you can be sure of the security of your investment, transparency of the operations, a good framework to protect against corruption or any undue influence. I think there is a debate in Argentina with a number of different political parties sharing this perception of opening up to the world. So what is not the case, I think, is that this depends on any political party. The governors we talk to are very open to international investment. So what we would like to see is a continuing consolidation, whoever is in power, of an Argentina that is welcoming of foreign trade, investment, fighting against corruption, looking for more competition, as we now see for example in aviation investment with new people travelling, with the creation of jobs, and this has a wider effect, not just in the airline business but on tourism. All this is good and is a trend we would like to see consolidated in the next few years. Was the UK Embassy contacted prior to the announcement of the IMF agreement? The IMF negotiates directly with the government of Argentina, that’s not something we get involved. There is a well-established structure in the IMF, whereby agreements are made at the staff level and then they go to the board. Obviously both the IMF and the Argentine government are in close contact with us. We’ve had visits to the UK of Marcos Peña, Jorge Faurie is there now, and they are explaining both to the government and the private sector how plans are going. We’ve made clear, in private and in public, our support for Argentina’s reform efforts. Is, in the case of the UK, the fear of a new populist government an additional concern? Argentina will choose its own government and it won’t depend on the UK, the IMF or anybody else. I would rather put it that the Argentina we want to work with is one which is open to working with the international community and open to looking afresh at some of the challenges facing the world. And we are very pleased to work with whoever wants to work with us on that basis, whoever may be the government. After Brexit, do you see the possibility of a Mercosur-UK free-trade agreement? Will it be easier than the EU-Mercosur deal? The short answer is yes. Obviously the final details of Brexit are still going to be negotiated. And once we leave, we will be then free to negotiate new trading arrangements with the rest of the world. We won’t negotiate arrangements with everybody at once, there will be a process but I am sure that Mercosur will figure on that list, and we are looking at this already. Obviously it is an important market, but there are also other important partners out there. Will it be easier than [an] EU-Mercosur [deal]? I think it will almost certainly be easier to negotiate with the UK than with the EU as a whole.